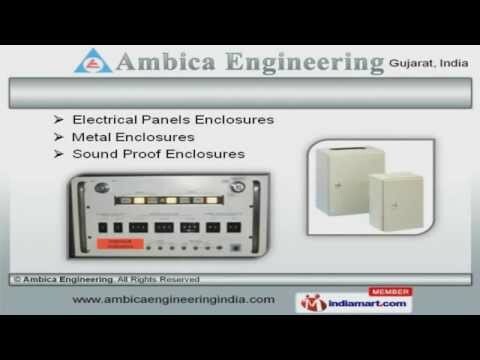 Welcome to Ambica Engineering, Offer Sheet Metal Products and Powder Coating Services. The company was incorporated in 1993 at Gandhinagar. International quality standards and skilled professionals make us different from others. Electrotherm India Limited and Topsun Energy Private Limited are some of our elite clients and we are backed by customized solutions and Industry leading prices. Metal Hinges, Sheet Metal Cabinets and Parts are some of our Products & Services. Our Electrical Panels, Metal and Sound Proof Enclosures are superior in performance. We offer Server Racks, Sound Proof Cabinets and Fiber Laser Cutting Machines that are acknowledged for their functionality. Metal Junction Boxes and Powder Coating Services offered by us are some of our best selling products. Along with that we offer Sheet Metal Parts for Automotive Industry that are extremely reliable. We also provide Aluminium Collapsible Tube Containers that are a class apart.